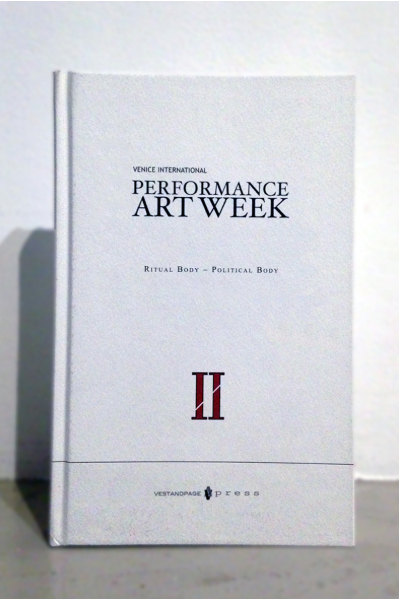 The VENICE INTERNATIONAL PERFORMANCE ART WEEK and VestAndPage press publish limited edition post-event catalogues documenting the performances and exhibitions of each of the Trilogy of the Body, together with essays on performance art related issues by international scholars. 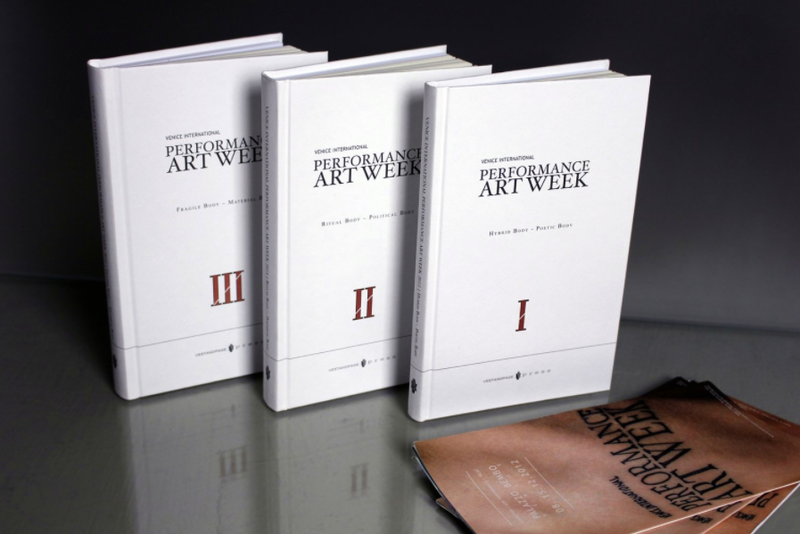 All publications are available for online order through VestAndPage press or Unbound. 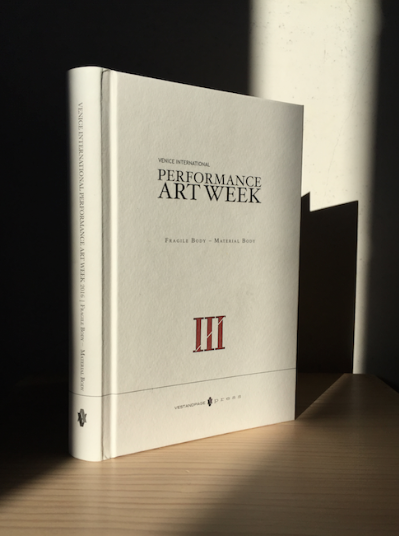 Yoko Ono, VALIE EXPORT, Hermann Nitsch, Jan Fabre, Ilija Šoškić, Boris Nieslony, Jill Orr, Lee Wen, Gonzalo Rabanal, Helena Goldwater, Manuel Vason, Joseph Ravens, Suka Off, Snežana Golubović, Jason Lim, Prem Sarjo, Nelda Ramos, Shima, BBB Johannes Deimling, VestAndPage, Santiago Cao, Francesca Fini, Francesco Kiàis, Wanda Moretti | Il Posto, Gabriela Alonso, Alperoa, Andrea Morucchio, Macarena Perich Rosas, Marcus Vinicius, Weeks & Whitford, Zierle & Carter, David Dalla Venezia. Bojana Kunst "Impossible becomes possible"
Andrea Pagnes "Considering the Nature of the Image and its Performativity"
Francesco Kiais "Unstable Harmonies or On the Hybridization of God"
Gabriela Alonso "The Bodies as Living Archives"
Richard Martel "Art, Performativity, Plasticity, Language: Access Codes"
Daniela Beltrani "Uncovering Poiesis in Performance Art"
Vito Acconci, Elias Adasme, Andrigo & Aliprandi, Alain Arias-Misson, Marilyn Arsem, Richard Ashrowan, Jelili Atiku, Adina Bar-On, Artur Barrio, Bean, Joseph Beuys, Waldo Bien, Tania Bruguera, Paulo Bruscky, Chris Burden, Barbara Campbell, Shannon Cochrane, Angel Delgado, El Siluetazo, Norma Flores, Terry Fox, Regina José Galindo, Melissa García Aguirre, Guillermo Giampietro, Allen Ginsberg, Arti Grabowski, Andrea Hackl, Tehching Hsieh, Zhang Huan, Waldemar Januszczak, Enrique Ježik, Sandra Johnston, Norbert Klassen, Zai Kuning, La Pocha Nostra, Sigalit Landau, Legend Lin Dance Theatre, Juan Loyola, Alastair MacLennan, Gastao de Magalhaes, Âhasiw Maskêgon-Iskwêw, Jill McDermid, Boris Nieslony & Gerhard Dirmoser, Sarah-Jane Norman, Omen Teatar, Clemente Padin, Gina Pane, Leticia Parente, Vela Phelan, Bob Raymond, Martin Renteria, Pedro Reyes, Rong Rong, Olivier de Sagazan, Inder Salim, Rosemberg Sandoval, Carolee Schneemann, Gerry Schum, Benjamin Sebastian, Gianni Emilio Simonetti, Terry Smith, Adrian Stimson, Ulay, VestAndPage, Alice Vogler, Julie Vulcan, Paul Wong, Wen Yau. Guillermo Gómez-Peña "In Defense of Performance"
Arantxa Echarte "Performances as Storytelling and Ritual"
Enrico Pastore "Short Story around a Dream"
Francesco Kiais "Social Carnal Love – The Intermediary Body and the Polis"
Oleksii Polegkyi "Ritual Body – Political Body"
Andrea Pagnes "On Performance Art, the Body and the Political"
Tania Bruguera "Manifesto on Artists' Rights"
Marina Abramović, Dimitris Alithinos, Marcel·lí Antúnez Roca, Marilyn Arsem, John Baldessari, Janusz Bałdyga, Evangelia Basdekis, Nathalie Anguezomo Mba Bikoro, Lisa Bufano, John Cage & Klaus vom Bruch, Sophie Calle,Kris Canavan, Cassils, Panos Charalambous, Thanassis Chondros/Alexandra Katsiani, Samanta Cinquini & Luca Nava, Helen Cole, Alexander Del Re, Jeannette Ehlers, Giovanni Fontana, Nicola Fornoni, Franko B, Coco Fusco & Paula Heredia, Christina Georgiou, Guillermo Gómez-Peña, Gim Gwang Cheol, gyrl grip, Ria Hartley, Mona Hatoum, Jeff Huckleberry, Irwin, Casey Jenkins, Maria Karavela, Anna Kosarewska, KörperSchafftKlang, Kyrahm & Julius Kaiser, Maria Klonaris & Katerina Thomadaki, Sara Kostić, jamie lewis hadley, Arrigo Lora Totino, Tran Luong, Ato Malinda, Antonio Manuel, Andrea Marcaccio, Noé Martínez & María Sosa, James McAllister, Paul McCarthy, Ana Mendieta, Johann Merrich, Mladen Miljanović, Linda Montano, Charlotte Moorman & Nam June Paik, Andrea Morucchio, Otto Mühl & Hermann Nitsch, Bruce Nauman, Martin O'Brien, ORLAN, OHO Group, Yoko Ono, Leda Papaconstantìnou, Mike Parr, Fyodor Pavlov-Andreevich, Alexandros Plomaritis, Alicia Radage, Preach R Sun, Ivana Ranisavljević, Douglas Quin & Lorne Covington, Pipilotti Rist, Mauro Sambo, Lerato Shadi, Marcel Sparmann, Stelarc, Demetrio Stratos, Matej Stupica & Lenka Đorojević, Suka Off, Theodoros,sculptor, Bill Viola, Andy Warhol & Jørgen Leth, Lawrence Weiner, Susanne Weins & Sašo Vollmaier, Jud Yalkut, Mary Zygouri | ART WEEK Fringe. 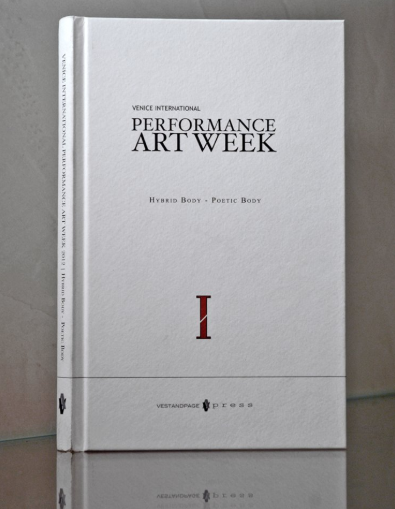 Lisa Newman "Venice International Performance Art Week As T.A.Z." João Florêncio "Porosity / The Body"
Francesca Carol Rolla "Body Matters, Bodies In Becoming"
Małgorzata Sady "Random Thoughts On Fragility"
Alicia Radage "Active Boundaries Of Occupation And Queer Fragility"
Guillermo Gómez-Peña "The New Barbarians: A Declaration Of Poetic Disobedience From The New Border"
Francesco Kiais "The Dream Of Antigone"
Felipe Monteiro "On Differentiated Bodies, Fragility And Alterity"
Penzo + Fiore "On The Fragile"
Marilyn Arsem "This Is Performance Art"
Marcel·lì Antùnez Roca "On Performance – In Conversation With Enrico Pastore"
Giovanni Fontana "Epigenetic Poetry – Hypervox and Electrophonic Mask"
Franko B "On Love And Romance"
Antonio Manuel "Fragments – At The Heart Of The Body Is The Work"
Stelarc "Prosthetic, Fractal & Phantom Flesh – Alternate Anatomical Architectures"